This citronette video recipe was filmed last fall, and was one of the first clips I produced for About.com. It just went live a few days ago, so I'm posting it today with a couple of warnings. When I filmed this, cherry tomatoes were at their peak of sweet deliciousness. They made a fine garnish for my asparagus with lemon dressing. Right now that probably isn't the case. The other thing I will give you a heads-up about is my presentation. Since this was one of the first video recipes where I had to introduce the topic in front of the camera, I was pretty unsure of myself, and compensated by completely overacting. It was like Emeril Lagasse had swallowed William Shattner. It's very funny to watch a clip this old, and realize how far I have come in regard to talking in front of a camera. As some of you know, it was a long time before anyone even saw my face. If you remember the old George Clooney bio photo, then you've been visiting this blog for a while. 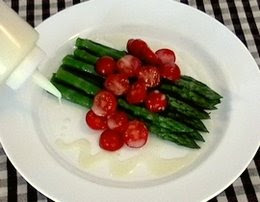 Anyway, the asparagus is piled high this time of year, so make some citronette, and enjoy! Whoah, I didn't know that Sergio Leone directed your first videos for About.com! That's freakin' cool. It must've cost you a fist full of dollars! The only thing better than the dubbed audio on the intro and outro is the delicious citronette. Thanks. Leave it to you to drop a Sergio Leone/fist full of dollars reference! You're the Dennis Miller of commentors. i kinda liked the dubbed intro and outro. it gave the video a smooth transition into the main content portion. Chef. Is this to be stored in the fridge or at room temp? Also how long will it stay fresh? Thanks a ton for these dressings. you didn't say the exact ingridiants! so can i please have them? Click link under video player to get full recipe!